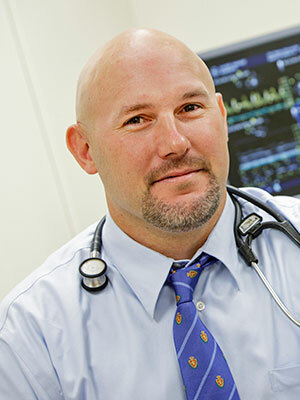 Dr. Baumwart is veterinary cardiologist originally from Clinton, Oklahoma. He attended Northeastern Oklahoma State University for his undergraduate degree in biology. He received his Doctor of Veterinary Medicine from Oklahoma State University. Following his graduation, he completed a one-year internship and residency at the Ohio State University. Following his residency he worked for a specialty hospital in Boise Idaho and Charleston South Carolina. Dr. Baumwart has authored several publications on cardiovascular disease in dogs and cats. Dr. Baumwart enjoys spending his leisure time with his wife and all their animals. He enjoys the outdoors hiking, camping, horseback riding, snowboarding, and fly fishing. Cardiomyopathies in the canine occur with less frequency in comparison to valve degeneration but remain clinically relevant. Certain breeds such as Dobermans, Great Danes, Boxers, and Irish Wolfhounds have been extensively researched and described in the current literature. While the breeds listed may have similar forms of cardiomyopathies their clinical presentation and prognosis can vary dramatically. This lecture will focus on diagnostic testing commonly used in clinical practice to appropriately classify the form of cardiomyopathy as well as discuss limitations with our current ante mortem testing. Discussion of common clinical testing will include radiography, echocardiography, electrocardiography in addition to newer genetic testing and biomarkers. In addition to diagnosis the pathophysiology, clinical presentation, and treatment options will be discussed.